10 Tips for a Successful Road Trip – Traveling Epic! My 15 soon to be 16 year old son recently got his drivers permit. Now that he’s behind the wheel, there’s a lot of interest on his part to get behind the wheel. 1. Getting from Point A to Point B: GPS Device, Maps, Smart Phone with GPS, USB on Mappoint, iPAD with GPS, Road Signs, etc… – I have used any number of ways to get across state lines. I like having the turn by turn directions, and if you do, you will either want a GPS like Magellan. The times have sure changed but many still prefer the maps for planning and executing their routes. 2. Plan a Route with some Fun destinations, It’s not about speed between A and B – Today I planned our road trip using RoadTrippers.com it worked great. I put in Salt Lake City, UT as the source and the destination. Then I added the places where I wanted to go. I really want to see Devils Tower from the Close Encounters of the Third Kind movie, then Crazy horse and Mount Rushmore, and then Teddy Roosevelt Park. The plan was to get me into North Dakota, the last state in the lower 48. I’ll be visiting my last state in the Union, Alaska next month. You can use Bing Maps, Google Maps, or various tools to see what the roads are between you and your destination, but how do you plan your route? I like to have things I want to see. Seeing something cool every day with a little hike or some fresh air is nice to plan out when doing 10 or 12 hour drives. You really shouldn’t plan to drive more than 12 hours in a day. Longest I ever did was somewhere around 15 hours back when I was in college, but usually it’s not about getting as fast as possible to the destination, but rather enjoying the road trip and seeing sites along the way. 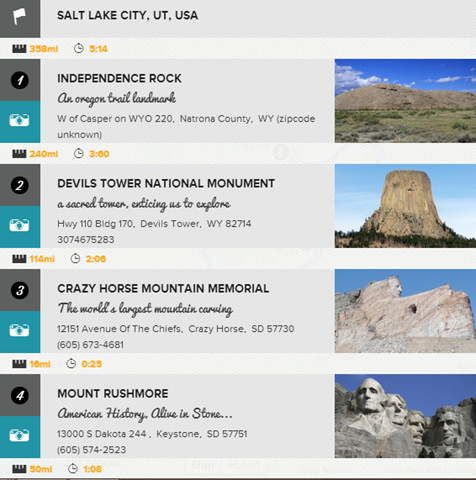 The RoadTrippers app allows you to display attractions, historical, and photo areas. 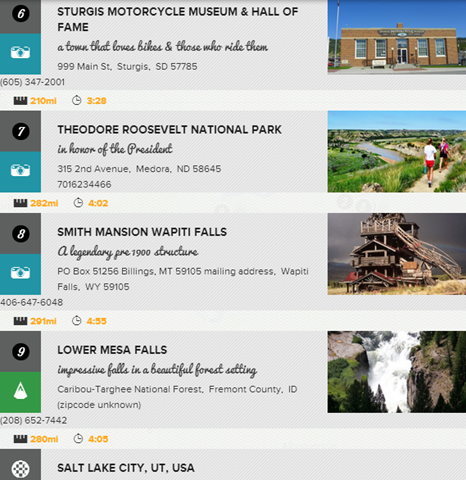 As a result I added a couple of additional stops, Independence rock, Sturgis (home to the biker gathering), a Mesa falls, and 1800’s Smith mansion. Normally I’d go through Yellowstone National Park, but I have visited the park nearly every year for the past few years. So while I am a fan, I need a break. If you’re traveling during the winter, watch the roads as is be sure to keep track of the pass weather, just in case it’s closed! 3. Be willing to stop along the route, Mix it up! – You do need to think about stops along the way that will break up the day and make it enjoyable. Maybe it’s the world’s largest ball of twine, or Wall Drug, or even just getting slurpees for the kids, but when doing big family trips, the kids memories aren’t just about the destination. They will remember the 6 legged cow, and the albino skunk more than they may remember the St. Louis Arch. Same with Disneyland. If they drove 14 hours the day before they get to Disney, they will be exhausted. 4. Use the Pool – You may feel like you need to get on the road as early as possible, but an early dip in the pool will serve to wake you up, and will give you energy you didn’t know you had. The kids will thank you for it. 5. Break it up – Rush day, chill day, Busy Day, Relax day. When I plan a family trip, I am use to doing it my way, which is cram the days full… Packed days. I thrive off of the destinations and adventures. I’ve found the family prefers to spend more time on the beach and less time at the pyramids. Less time in the caves, and more time in the pools. Less time on the Hike and more time chilling at the cabin. To keep everyone happy I try to mix it up so we can both be happy. 6. Get fresh air – Seems there are less and less rest stops. I push myself when I do long road trips, and often stop only when I need more gas. That’s not a great practice. You need to get the blood flowing. There are conditions that can happen. You’ll notice a lot of the attractions on this trip will involve some decent hikes. I’m looking forward to doing some father and son bonding. Hikes are a great way to get to know the others on the trip. Often up in the hills there’s no 3G, no Wifi, and the power on the devices in the car are likely drained or having been used for the last 6 hours are now a bore. Walking, hiking, or simply exploring around national parks, or around the downtown… there are ways of keeping the blood flowing and supporting your goals. Think about all the junk you’re eating along the way minus your normal exercise routine. Feels good to find balance between the long drives with a good walk or hike. 7. Plan for snacks – Gas stations ultimately are limited on the quality of food you can get. Granola, nuts, fruit, aren’t popular in gas stations. Pop, candy bars, and circus peanuts, and peach rings… now you know what we end up with. Much better to plan for snacks so you can mix in some healthy stuff. It shouldn’t be hard to find a grocery store. They really are all over the world. The convenience of the gas station is just too easy. Learn to enjoy water. May make sense to bring a water bottle and just fill up with ice. Takes serious discipline. I’m not all there yet, but I know I should be doing that. Think about how you want to carry water and keep it cool. You do need to drink plenty of water. 8. Plan your hotel, B&B or camping strategy, get a good night’s rest, if you’re feeling pain get an adjustment or massage – You may be pushing through to arrive at your destination. Just because you arrived late doesn’t mean you need to be up at the crack of dawn. If you do need to be up at sunrise keep your drapes open. Natural light will help restore you and help you make up more naturally. Careful on doing anything dangerous. 8 hours of downtime is good. Remember it’s about regeneration. After I’ve done some horrible thing to my body… those other side of the world 40 hour flights, I reward myself with a massage. Easy to get in Asia, it’s becoming more and more common in many countries around the world to get a massage. I love space tanks as well for their restorative qualities. I bet that’s another post. Plan your Hotels and know what you’re getting into. Consider Bringing Your Own Pillow and a Spare Blanket. If you’ve got the room in the car, you may want to toss in a pillow and blanket. Great for naps, and your neck is use to your pillow. Consistency. There’s a lot of stress on your neck during the drive, so taking off that stress at night may really help. International folks may enjoy the http://VRBO.com and couch surfers the http://airbnb.com which both have a huge variety. The B&B’s can be a way to combine the destination as part of the tour. A lot of them are online these days, and it takes some research. Top travel sites for planning include http://kayak.com http://expedia.com http://orbitz.com http://hotels.com http://priceline.com http://Travelocity.com http://tripadvisor.com they all have their pros and cons and expose most of the major chains. Trip Advisor has attractions in it’s database. If you can figure out which hotel you want and then call them directly, you may be able to simply make the reservation without having to pay. They may be able to hold it with a card. As well, lot of opportunities to collection hotel points for free nights or double dip on frequent flier miles like at Hilton depending on your loyalty. 9. Packing & Keep the Car Clean – I always pack light as a world traveler, but when I’m in my own car it’s easy to get sloppy. I count out the days and pack minimalist, but since I’m in the car I will pack the snacks and water separate. Putting the snacks in a small box will keep things from rolling around. If you can think modularly of those things that are for the car can stay in the car and then only what you need for the night has to go into the hotel. You may be driving an RV or Staying at Camp grounds. This use to be so much easier back in the 70’s and 80’s. Now the camp grounds are really spread out and they definitely don’t have the marketing budget of the hotels. For cheap hotels there are those little magazines that mention the walk in rate discounts. There are a lot of strategies to employ here. I’ve used a dozen different strategies and I do a lot of hotels. A lot of it is tolerance around cost, and tolerance around conditions. In the US there really is a hierarchy on national and world wide brands. 10. Tune up the car or consider a Rental – You may end up being focused on the agenda and packing, but ultimately what can make or break a trip is the condition of the car. Remember the vehicle you may be driving has often not been driven long distances, and may need fluids antifreeze an oil change and more. Get that tune up that you’ve been putting off, not on the day you’re trying to get out of town, but instead a few days prior. In road trips in the past I’ve encountered flat tire, overheating car (ended up dying), and transmission issues that cost me thousands. Even cleaning it out and having it vacuumed can help to start off on the right foot. Some may want to consider renting a vehicle. In some cities the daily and weekly rate may be worth the wear and tear on your own car. Big road trips can add a lot of miles all at once. These road trips can be fun with the top down, and in a sports car. For some, that is the dream. For others, it’s about a camper or RV to get on the road… Make sure you’ve got plenty of accessing to funds. Really, these tips are very essential. A person who does not follow these tips, may have to face many obstacles during their road trip. Have you seen MotoGoLoco Maps yet? Mainly for motorcyclists, but proving very popular with folks looking for a quick and easy way to create routes via Google Maps and transfer them to a GPS. If you feel as if you’ve done enough driving for the day, heed that feeling. Pushing yourself beyond your limits puts you into the danger zone of drowsiness, poor reaction time, and bad decision-making. Any drowsiness should be heeded; find the nearest rest stop, pull over and take a good 20 minute break that includes stretching, walking, and perhaps eating and drinking. Of course. You should never push yourself to where you might fall asleep. It’s amazing what you can get from a 30 minute power nap.